In implementation of Government Resolution No. 35/NQ-CP on enterprise support and development to 2020, the Ministry of Agriculture and Rural Development will review its policies to facilitate investors in the agriculture sector. Deputy Minister of Agriculture and Rural Development Ha Cong Tuan talks with Vietnam News Agency on the issue. Which policies will the Ministry of Agriculture and Rural Development revise to create favorable conditions for agriculture investors? In recent years, the Government has issued numerous mechanisms and policies to attract investors into agriculture, the most important of which are Decree No. 210/2013/ND-CP on incentives for investors in agriculture and rural areas, and Decree No. 55/2015/ND-CP on credit for agriculture and rural development. There are also many other supports for agriculture investment such as poverty reduction policies and the national target program for building a new countryside. These policies have created initial changes. A number of major enterprises have invested in agriculture in association with the implementation of Decree No. 118/2014/ND-CP on reorganization, renewal, development and improvement of efficiency of agriculture and forest companies. Although many enterprises have shown their interest in agriculture investment, the number of enterprises and investment amount remain low as compared with other sectors. To implement Government Resolution No. 35 and Resolution No. 19/2016/NQ-CP on major tasks and solutions to improve the business environment and raise national competitiveness in 2016-17 with orientations to 2020, the Ministry of Agriculture and Rural Development is reviewing current incentive policies to find out why these policies have not been realized in practice. For instance, many businesses complained they could neither access credit capital nor incentives under Decree No. 210. The Ministry is also drafting a decree on incentives for foreign investment in agriculture, mostly in food safety, fertilizers, animal feeds and veterinary drugs. Next is the land policy, which is important for agriculture investors. The State and the agriculture sector must create conditions for enterprises to get land for production but also have to ensure farmers have farming land. We cannot recover land from individual households to give to enterprises but will reorganize forest companies to set aside a certain area of land for agriculture investors to build processing facilities and produce hi-tech products. We recommend enterprises align with farmers to create the large-field model not only in starchy food production but in growing industrial and forestry crops. Alignment is important since the State cannot arrange dozens or hundreds of hectares for enterprises but should offer incentives for such alignment. Finally, equitization and restructuring of state enterprises are essential to attract non-state sectors to invest in agriculture. The Ministry is working on a plan for agriculture and forest companies, under which around one million hectares will be slated for equitization of forest companies. The Ministry is also set to equitize all wholly state-owned enterprises assigned to it by 2017, and withdraw state capital at equitized enterprises. Some major companies have had all state capital withdrawn, including the Vietnam National Vegetable, Fruit and Agricultural Product Corporation, the Vietnam National Tea Corporation and the Agriculture Supplies Corporation. The Government has requested ministries and sectors to report on their action plans for implementation of Resolution No. 35 before July 1. How about your ministry? Our Ministry is in the process of devising a plan for the implementation of Resolutions No. 35 and 19 for which we have set up a steering board for implementation. The Ministry is focusing on revising land mechanisms and policies and boosting administrative reform, particularly business conditions directly related to enterprises. The Ministry has recently submitted a draft decree on business investment conditions in agriculture and rural development, under which the number of conditional business lines will drop to 32 from 99 currently. For each business line, administrative conditions will also be cut to the utmost to reduce costs for enterprises. How can the Ministry cut this number to just 32 from 99? 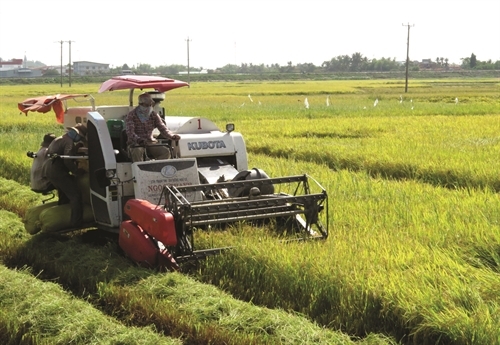 Implementing the 2014 Investment Law, the Ministry of Agriculture and Rural Development has reviewed legal documents related to business investment conditions in agriculture and rural development. Specifically, we have gone through seven laws, five ordinances, 17 decrees, one premier decision and 39 circulars of the Ministry which contain provisions on business investment conditions. Under these documents, there are 99 conditional business lines in the agriculture sector but according to the Investment Law, there are only 35 conditional business lines in the agriculture sector. Of these 35 businesses, the Ministry proposes the Government to further remove three, namely trading in bonsai and shade trees; trading in firewood and firewood coal; and trading in fishing nets and gear. Other business conditions will mostly focus on product quality and food safety while administrative procedures and conditions will be minimized. So, our Ministry has basically completed the task assigned by the Government. Which area do you find most difficult in considering reducing business conditions? We have determined right at the beginning and reported to the Ministry of Justice and the Ministry of Planning and Investment that we will not mechanically transfer business conditions contained in the current 39 circulars to a new decree, but will set business conditions with fewer administrative procedures.